Learn About Whrrl and Share Your Stories! 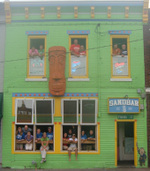 - The Sandbar...Home of the Indoor Hurricane! Learn About Whrrl and Share Your Stories! Since the Twestival Lawrence is coming up tomorrow, I thought this was a great time to share some information about Whrrl. It's something fun you can use anytime you want to share your adventures with friends. I've experimented with it a little bit- you might have seen the recent Whrrl story I created for the Sandbar Ottawa birthday party. It's also way down on the very bottom right hand side of this page. My friend Jenn wrote this introductory lesson about Whrrl for you. If you're planning on attending the Twestival tomorrow, create a Whrrl account, find some friends, and join the story! There are so many people to meet and so many fun things to do at the Lawrence Twestival this Thursday...how will you ever get to experience it all? How about by adding Whrrl to your list of social media explorations? Whrrl is a way to share your "story" with the public, your friends and your family...and a way for your friends and family to join in! Adding pictures, locations and text to a story as it happens...then instantly publishing it to Facebook and/or Twitter. This gives many people the chance to see what is happening...from many different perspectives! You simply "join" a story and start adding text and photos. Don't want to use your mobile for real time additions? You can take pictures and add them online later! We will be starting a Whrrl Story for the Twestival on Thursday night! Want to join in? Just go to Whrrl and register yourself for an account. Add some "friends" to your list to get you started: Ben Smith (@benasmith), Jenn Hethcoat (@superjennblogs), Deb Johanning (@thesandbar or @debjohanning), Briana Saunders (@briana9), or Zack McDougall (@zackmcdougall). If you turn your notification "on" ... you will see when any one of us begins a story for the evening. Simply click on it from your phone and "join the story"! Whrrl has a great tutorial for building a story with friends that makes it simple to understand. You can find that tutorial HERE. There is a free app download for iPhone users that makes this a cinch! Either visit the Whrrl Homepage and enter your phone number in the iPhone widget to have an app sent to your phone...or search the app store for "Whrrl". You can find a tutorial HERE. You can also find online tutorials for non- iPhone users HERE that will show you how to text your way into a story. Thinking about adding some pictures after the event? Simply view the tutorial found HERE. Questions? Find one of us at the Twestival and we will do our best to help you get going...once you do there will be no turning back. You will want to share your life on Whrrl every day!